To take advantage of our industry-leading warranty and customer service, please complete the form below. Your product's serial numbers should be located on the rear panel. 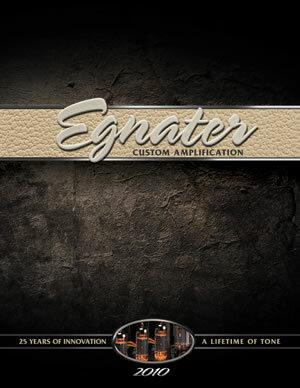 Egnater Amplification manufactures some of the world’s most innovative all-tube amplifier, combos and speaker cabinets. Egnater takes great pride in thoroughly testing each product prior to shipment. Egnater warrants that this product shall be free of any defects in parts or workmanship, if used under normal operating conditions, to the original purchaser for a period of three (3) years from the date of purchase. A dated sales receipt from an authorized Egnater dealer will be required to establish coverage under this warranty. This warranty does not cover damage caused by accident, neglect, abuse, normal wear and tear, disaster, misuse, abuse, over-powering, negligence, inadequate packing or shipping procedures or service/repairs or modifications to the product which have not been authorized or approved by Egnater. If this product is deemed defective in materials or workmanship as warranted above, your sole remedy shall be repair or replacement (at Egnater’s discretion) as provided below. Customers Outside the United States - The warranty period above may be different in your country and is determined by the local Egnater distributor – please check with your local dealer or distributor for warranty details. Egnater warrants, to the original purchaser, that the tubes used in an Egnater amplifier/combo shall be free from defects for a period of 90 days from the original date of purchase. A dated sales receipt from an authorized Egnater dealer will be required to establish coverage under this warranty. This tube warranty will automatically terminate 90 days after the original retail sales date. If a tube fails within the 90 day warrant period your sole remedy shall be replacement of the defective tube(s) as provided below. Egnater warrants footswitches and speakers will be covered under the manufacturer's warranty for a period up to 90 days from original purchase to the original purchaser only. In the unlikely event that a defect should occur, follow the procedure outlined below. Defective products must be shipped, together with proof of purchase, freight pre-paid and insured to an Authorized Egnater Service Center or directly to Egnater. If a product must be returned to Egnater for warranty replacement/repair, a Return Authorization Number must be obtained from our Customer Service Department prior to shipping the product. Please contact our Customer Service Department for the Authorized Egnater Service Center nearest you. Products must be shipped in their original packaging or its equivalent. In any case, the risk of loss or damage in transit is to be borne by the purchaser. The Return Authorization Number must appear in large print directly below the shipping address. Always include a brief description of the defect, along with your correct return address and telephone number. When calling to inquire about a returned product, always refer to the Return Authorization Number. If Egnater determines that the unit is defective in materials or workmanship at any time during the warranty period, Egnater has the option of repairing or replacing the product (at Egnater’s discretion) at no additional charge, except as set forth below. All replaced parts become a property of Egnater. Products replaced or repaired under this warranty will be returned via ground shipping within the United States-freight prepaid. Egnater is not responsible for costs associated with expedited shipping, either to Egnater or the return of the product to the customer. Customers Outside the United States - The return procedures above may be different in your country and is determined by the local Egnater distributor – please check with your local dealer or distributor for return procedures. In no event shall Egnater be liable for any incidental or consequential damages resulting from the use or failure of an Egnater product or any loss of income, satisfaction or damages arising from use of same even if an Egnater dealer has been advised of the possibility of such damages, or any other claim by any other party. Some states do not allow the exclusion or limitation of consequential damages, so the above limitation and exclusion may not apply to you. This warranty gives you specific legal rights and you may also have other rights which may vary from state to state. Please complete and mail the Purchase Information Card within (10) ten days of the date of purchase so that we may contact you directly in the event a safety notification issued in accordance with the 1972 Consumer Product Safety Act. Our dedicated staff is ready to help you with any warranty or product questions you may have. Please call 1-877-EGNATER (9:00AM to 4:00PM Pacific Standard Time).